The Three Moles was built by William Townley Mitford and opened in 1872 as ‘The Railway Inn’. After 6 months the name was changed to ‘The Three Moles’ and to this day remains the only pub in the world with this name! The pub was built to serve Selham Rail Station on the opposite side of the road which later closed in 1955. 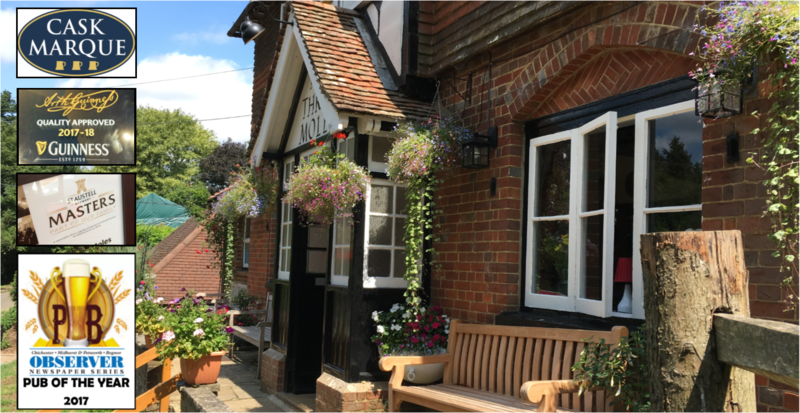 The pub however has continued to trade and has over the years won a number of CAMRA awards including West Sussex Pub of the Year on at least 4 occasions as well as coming a national runner up. The name of the pub comes from the Mitford family crest, who to this day still own the building, which has three moles depicted on it. We know that one of the moles comes from where the estate started in Molesden, Northumberland and the other comes from part of their estate being on the edge of the river mole. The third is currently a mystery to us and we are continually researching to try and find out!